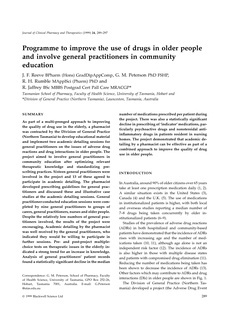 As part of a multi-pronged approach to improving the quality of drug use in the elderly, a pharmacist was contracted by the Division of General Practice (Northern Tasmania) to develop educational material and implement two academic detailing sessions for general practitioners on the issues of adverse drug reactions and drug interactions in older people. The project aimed to involve general practitioners in community education after optimizing relevant therapeutic knowledge and standardizing prescribing practices. Sixteen general practitioners were involved in the project and 13 of these agreed to participate in academic detailing. The pharmacist developed prescribing guidelines for general practitioners and discussed these and illustrative case studies at the academic detailing sessions. General practitioner-conducted education sessions were completed by nine general practitioners to groups of carers, general practitioners, nurses and older people. Despite the relatively low numbers of general practitioners involved, the results of the project were encouraging. Academic detailing by the pharmacist was well received by the general practitioners, who indicated they would be willing to participate in further sessions. Pre- and post-project multiple-choice tests on therapeutic issues in the elderly indicated a strong trend for an increase in knowledge. Analysis of general practitioners’ patient records found a statistically significant decline in the median number of medications prescribed per patient during the project. There was also a statistically significant decline in prescribing of ‘indicator’ medications, particularly psychoactive drugs and nonsteroidal anti-inflammatory drugs in patients resident in nursing homes. The project demonstrated that academic detailing by a pharmacist can be effective as part of a combined approach to improve the quality of drug use in older people.